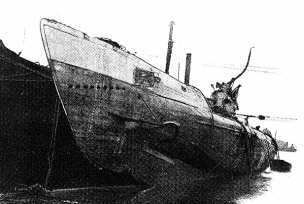 I was a youngster when I first heard the tale of UC-44, a German U-Boat that sunk when she struck her own mine and was salvaged and brought back to Dunmore East. There her design and fighting capabilities yielded invaluable information to tackling the U-Boat threat. It was only over Christmas that I came to realise the true back story to the affair, filled with intrigue, subterfuge and probably a lot of luck. For UC-44 was lured to Dunmore with the express purpose of being captured and the outcome played a role in an allied victory of the First World War. In July of 1917 UC-42 deployed mines in Waterford harbour aimed at interrupting the flow of provisions out of Ireland to the allied side. Usually this meant that mine sweepers were deployed and the port access cleared. However, not this time. This time the admiralty or at least those in control of the western Atlantic approaches based at Queenstown (now Cobh) had other ideas. The losses being endured by the allies to U-Boats were steadily increasing. Resources were stretched, and the Admiralty seemed more content on maintaining a blockade of Germany than protecting those ships supplying the allies. Admiral Bayly and his team at Queenstown were fighting a losing battle despite the setting up of an anti-submarine division in December 1916, the introduction of Q ships, airships and the added resources gained when America joined the war in April 1917. American ships arrived at Cobh in May and were on patrol next day. The Navy needed all the help they could get and so the intelligence value of an intact sub was considered a priority. The admiralty learned much about the design and capabilities of the submarine and they were keenly interested in the rescued mines and the deployment system. However it was the log books and other papers which arguably proved the most value. The log proved incontrovertibly what many had suspected but which was denied by senior naval personnel. It highlighted how easy it was for Tebbenjoahnnes and other U Boat commanders to avoid detection and slip through the existing protection around Britain. (Nolan: p235) Such information coupled with the with the rates of shipping losses highlighted that Britain and her allies were at risk of losing the war unless the U Boat menace was finally dealt with. Macintyre (1965) explains the failure to grasp the U-boat menace "...submariners...comprised a breed apart" They suffered "...contemptuous refusal of senior officers and their contemporaries in surface warships to take them seriously." This attitude created a "...mental inertia or lack of imagination of the great majority making for an obstinate conservatism" (Macintyre p 20). Some have claimed that the retrieval of UC-44 actually turned the war for the allies. What is probably true at least is that it helped in the continuing shift in attitudes in naval strategy and personnel, and arguably contributing to the removal of Admiral Jellico as commander of the navy, More ships and resources were provided to tackling the issue. The Dover barrage including 9,600 mines was completed and finally the convoy system was introduced. An enduring mystery of UC-44 was the notion that she was sunk by her own mine. There are many written accounts, both in books and online that suggest several scenarios. The majority believed for years that it was her own mine that sunk the ship. However, Nolan (2009) speculates that it may have been a casualty of the mines originally laid by UC-42, and as such a casualty of the trap created by the allies. 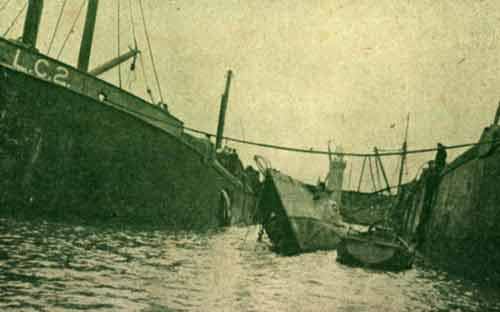 More recently Stokes (2015) speculates that both UC-44 and UC-42, which struck her own mine in Cork Harbour later in 1917, were victims of sabotage, and that the deployment mechanism, or the mines themselves may have been tampered with by British agents operating in the German Naval dockyards. I'd imagine that we will never know for certain. My thanks to Michael Farrell of the Barony of Gaultier Historical Society for providing the names of the Power brothers of Dunmore mentioned above. And to Ray Mcgrah for the name of his father also mentioned. Macintyre. D. Fighting under the sea. 1965. Evan Brothers Ltd. London.